Venez voir Denis Sungho, guitariste coréen exceptionnel, pour la première fois au Luxembourg. Au programme, des pièces originales, ainsi que des morceaux de Queen, d'Ennio Morricone et bien plus. Come see Denis Sungho, an exceptional Korean guitarist, for the first time ever in Luxembourg. Expect to hear original pieces, some Queen and tracks by Italian composer Ennio Morricone among many others. Le Bazar International est un évènement annuel où des volontaires d'une soixantaine de nationalités différentes se rassemblent pour partager leur culture par la vente de plats nationaux et autres articles culturels. Tous les bénéfices sont donnés à plus d'une centaine d'organisations caritatives. Cette année le stand coréen vendra du Kimchi, du Japchae et du Bulgogi. Plus de détails début novembre.The International Bazar is an annual event where volunteers from more than sixty different nationalities come together to share their culture through the sale of national dishes and other cultural items. All profits are donated to more than a hundred different charities. This year the korean stand will be selling Kimchi, Japchae and Bulgogi. More details starting in early November. LES AMIS DE LA COREE A LUXEMBOURG ASBL. fête son 10ème anniversaire avec un programme KOREA WEEKEND sponsorisé par Rodenbourg Motors. Au programme: Concert du duo SINAKOWAN, dîner et déjeuner coréen, démonstration d'art martial Wha Rang Do, K-Pop, atelier de Kimchi et cérémonie du thé coréen. A display of traditional Korean dance and music, performed by the Seoul Dongdaemoon Culture Society. The Bazar International is an non-profit annual event taking place during the last weekend of november, whereby about 65 stands, each representing a nation present in Luxembourg sell their national cultural products. The profits made at the Bazar International are donated to various NGOs around the world. Friends of Korea supports the Korean stand of the Bazar. The Bazar International is an non-profit annual event taking place during the last weekend of november, whereby about 60 stands, each representing a nation present in Luxembourg sell their national cultural products. Join us for Korea Day! 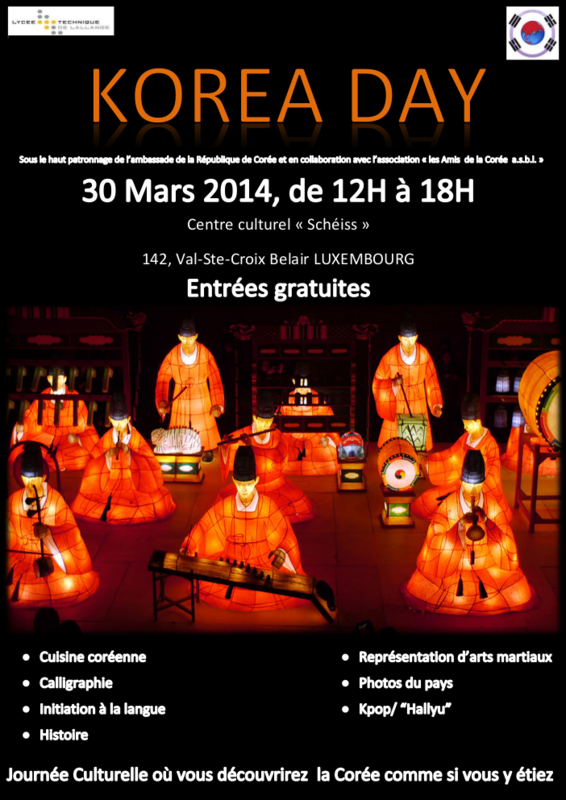 An event all about Korean culture, with Korean food, taek-won-do, K-pop, calligraphy and much more! More information here (PDF download).